The Pennsylvania Board of Fish and Boat (PFBC) Commissioners proposed major changes to the existing delayed-harvest-artificial-lures-only (DHALO) stream sections when they met on January 21-22. Anglers who enjoy the special regulation waters will find trout harvested earlier and be sharing these streams with some who will be able to fish live bait year round if these changes go through January 1, 2016. The current regulations for DHALO waters provide year-round trout fishing opportunities using only flies and artificial lures such as spinners. No bait is allowed. Anglers may harvest fish between June 15 and Labor Day with a limit of three fish a day greater than 9". Less than 96 miles of water and 55 streams make up the DHALO regulations that include stream sections on West Valley Creek, Oil Creek, Neshannock Creek, Black Moshannon Creek, First Fork Sinnemahoning Creek, Pine Creek, Quittapahilla Creek, Laurel Hill Creek and Tulpehocken Creek. The newly proposed rule changes by board members take the special regulation program in a very different direction. Changes for the DHALO move up the start of the delayed harvest period three weeks to the Saturday before Memorial Day. The daily limit would be set to three fish greater than 7". Bait fishing would be permitted during the new harvest period for all anglers. Finally, anglers 16 and younger would be able to fish with bait year-round. The PFBC hopes to provide more opportunities for anglers and enhance the fishing experience with these changes. “By expanding the harvest period and allowing the use of bait, we can increase angler success while improving the use of the trout before they are lost to natural mortality in the warmer summer months,” said PFBC Executive Director John Arway. Pennsylvania contains over 85,000 miles of streams and rivers. The PFBC and cooperative nurseries stock over 4,100,000 trout in approximately 735 streams and numerous lakes across the state. The DHALO projects are made up of 55 streams that on average cover about 1.6 miles of water. All DHALO streams are subsections of approved trout waters open to public fishing and stocked for all anglers in the Commonwealth. Back in 2004 then Commissioner President Samuel M. Concilla of Erie County shared his views at a board meeting about the DHALO regulations as they are established today, "I think Delayed Harvest is one of the best programs developed by the commission. It offers a lot of angling opportunities." Over ten years later many anglers still agree and are not in favor of the proposed changes. "The new proposal is not the right approach and I don't see how harvesting more fish sooner will make fishing a better experience on these streams" shared Ron Kolman of Indiana County, Pennsylvania. Many of the DHALO streams contain hold-over trout during the summer and are available for another fishing opportunity by anglers in the fall. This is important to anglers with most fall stockings having been eliminated. Anglers fishing in DHALO streams with flies and artificial lures are able to catch and release a trout multiple times. Early harvesting and bait fishing clean out a project much more quickly. "Bait fishing mortality is greater than the use of artificial lures. Even in the Delayed Harvest period, anglers with bait will likely be killing trout through their intent to catch and release further reducing the angling opportunities for those willing to abide by the original regulation," offers Maurice Chioda of York County. In addition, Trout Unlimited worked hard with the PFBC to establish and encourage landowners to provide access for anglers to these special project waters based on the current regulations. Will these landowners still provide the same access if the regulations are changed? Memorial Day weekend is considered by many anglers as the top weekend for fly fishing and continues for several weeks afterwards. 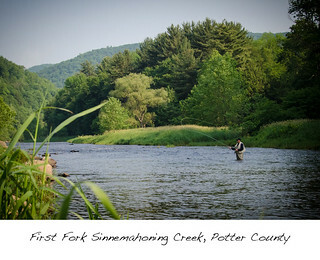 Pennsylvania offers some of the most premier fly fishing destinations on the east coast, which includes many of these special regulation streams. Tourists travel to the state to enjoy these unique (fly fishing) waters through the late spring and summer. With limited budgets, will tourist still want to come to streams already harvested or go to other more appealing destinations in the west or north? Thoughts and comments can be shared in the Paflyfish forum. Directing comments to state officials is even more important. The proposed changes will be published as a notice of proposed rulemaking in the PA Bulletin for a 60-day public comment period. If adopted on a final rulemaking, the amendments would take effect on January 1, 2016. Interested persons are encouraged to submit written comments, objections or suggestions about the proposed rulemaking to the PFBC Executive Director John Arway, Pennsylvania Fish and Boat Commission, P.O. Box 67000, Harrisburg, PA 17106-7000. Anglers are encouraged to contact their Pennsylvania State Representatives. Written letters are best and Representatives can be found at the Pennsylvania House of Representatives website. The comment period is now officially open for the proposed Amendments to Chapter 65.6, Title 58, Part II. The official comment period is from March 14 through May 13, 2015. I am very much opposed to this proposal, so is the Pennsylvania TU and 89% of the members on this site. Please let the PFBC know you are opposed to the changes with a letter or online here.